Muay Thai Warriors returned on Sunday the 4th of November with a live broadcast that was disjointed and actually aired very little of the fights. Dates and times weren’t really settled upon until the last moment. The following are the results that I know of. I will update this post as I learn more of the results myself. Rungravee Sasiprapa defeats Juan Mario Kaewsamrit by unanimous decision at 60kg and wins the World Professional Muaythai Federation lightweight championship. Superbon Suppachai Lukchaomaesaiwaree defeats Umar Semata at 66kg by unanimous decision. Apparently, Umar was never fully in the fight and it showed as Suberbon had an easy time of outpointing Umar. Khim Di Ma defeats Steeve “French Diamond” Archaumbault at 60kg by unanimous decision. It appears that much of the broadcast was devoted to basically publicity and not so much to the fights. As a result most of the card never made it to broadcast either to a shortage of purchased time or that same time being devoted to something else. It seems some logistic issues and broadcast choices weren’t fully sorted out ahead of time. 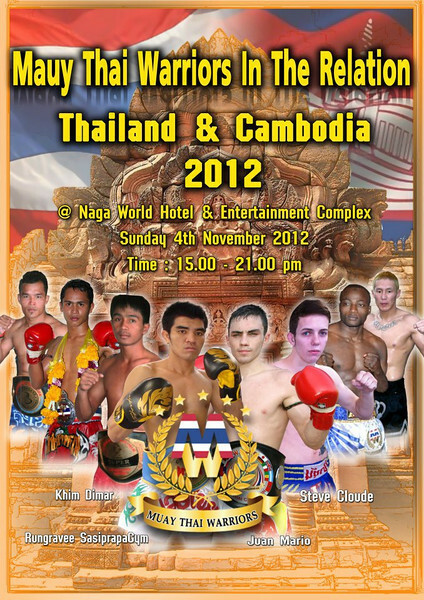 To me, the fights people would want to see would be a Thailand Vs. Cambodia card. The versus concept is a good one and it worked way back in the S-1 2003 tournament where Thailand’s Suriya was matched against Khmer’s Eh Phuthong. The nation versus nation marketing seems to work well to build excitement around cards. Perhaps, the organizers were already looking forward to their ambitious and big name filled December card already and neglected this particular event a bit. At least the China event seems to be coming together quickly and hopefully it is as memorable as the last fight card they held in China. 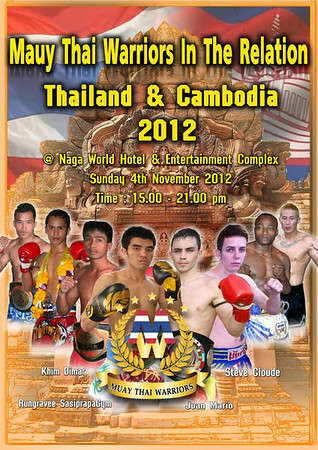 .Rungravee Sasiprapa gym *Thai* Won p Juan Mario *Spain*60 kg. 2.Khim Di Ma *Khmer* won p Steve Claude * France* 60 kg. 5.Apirak K.T. Gym *Thai* won p.Leonardo Monteiro *Brazil* 65 kg. 6.Sen Rady *Khmer* won p Yusuke Otahara *Japan*54 kg. 7.K Nor.naksin * Thai* lose ko3 Kamen Picken * England* 65 kg. 8.Keo Rumchong *Khmer* won p Victor Nagbe* Australia* 68 kg. ~ by fatsoking on November 4, 2012.